What a day! We are all home safe and sound and made the trip in a little over 8 hours. The nurse practitioner asked me before lunch what our travel plans were and I told her we had a long drive. She asked if we'd like to get an early start driving tomorrow am, meaning getting discharged this afternoon (Weds.). I said that'd be great. Of course, he still had to get interrogated and get a chest x-ray, do all the paperwork, etc. We thought about getting a good night's sleep and heading out in the morning but we both got the itch to get home as soon as possible so we took off about 4:50pm eastern time. Greg drove the whole way. Some exciting news: Brandon Inge, the third baseman for the Detroit Tigers, was at the hospital today for a special dedication ceremony naming today "Inge Day" there because of all the time and money he's given to the hospital and patients. The Tiger's mascot, Paws, was also on hand. We didn't wait in line for autographs, but we did get Connie's pic with the tiger upstairs as he visited kids in their rooms and delivered a ball park style lunch of hot dogs, nachos, frozen lemonade and caramel corn. I'll post it when I unpack the camera!! Discharge Status: The results of the discharge testing show that Connie's LV heart function has improved since immediately post-op and the cardiologist today felt that the one wall that is not squeezing as hard as it should should continue to improve now that the mitral regurgitation is mild. 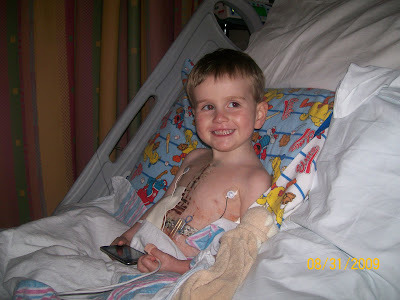 The little issue we had with his atrial lead means that his heart is now requiring more battery power from his pacemaker to generate an atrial beat, meaning the pacer is now calculated to last 4.5 more years instead of the 6 years it was on track to last (will have to be replaced sooner). There is a chance that as his heart heals from the trauma of surgery, the power can be turned down some and save some of the battery life. Time and Dr. Bromberg will tell. His post-op meds include Enalapril for blood pressure, lasix for fluid build up (we expect he'll be taken off this in a bit), synthroid for thyroid (we expect he'll also be taken off this since it was to treat a problem caused by another heart med he is no longer on). He's been given a prescription of oxycodone for pain and is taking tylenol and ibuprofen. He's doing great and is so excited to be home finally! We are so blessed to have hundreds of people lifting Connie up to you in prayer and we are incredibly grateful for their love and support. Please continue to bless his recovery at home. Thank you for such a smooth surgery and recovery. This is such new territory for us to finally be on this side of the fence, the ones who go home quickly. 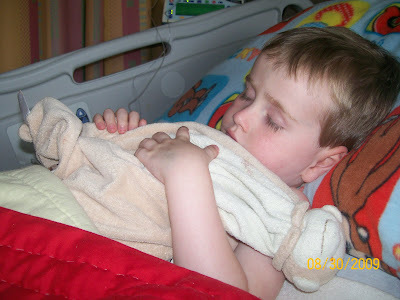 Please watch over all the little children Connie left behind who are still recovering or about to have surgery. Guide their medical teams and parents and give the children peace and comfort. In Jesus' precious name, Amen. Echo looks better. Atrial battery turned up on pacemaker. Posting from iPod so keeping it short. We're looking at coming home tomorrow!! Connie got his chest tubes out a little after 8:30 this am. I don' think the versed really kicked in until afterward, but oh well. It was pretty quick. He also got his pacer wires out and is scheduled to be in the echo lab like five minutes ago. He's pretty wobbly after the sedation so we'll ride down together in a wheelchair. His prescriptions have been called down to the pharmacy so now it's just a matter of waiting to see how is x-ray looks tomorrow and getting his pacer interrogated before we can bust out of here. Connie didn't have any appetite this morning or at lunch. Greg and I started to worry, thinking that something might be going on with his heart. The appetite has been a tell tale sign all summer. After his nap, he ate two bags of lay's potato chips and most of a cereal bar. Now he's finishing up a hot dog with the bun and some chocolate milk. Guess he's just being picky! 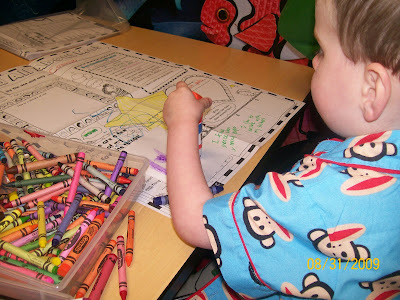 We saw Dr. Bradley (EP) while we were in the playroom and he said Connie needs to be interrogated again tomorrow since they made some changes to his pacer. He said that his atrial lead "isn't as good" as it was when we came in. Sometimes surgery can do that. I asked if that meant we had to have another surgery to replace the lead and he said he isn't sure yet. He just wants to interrogate it first and then maybe we can just wait and see. We ran into Dr. Bove in the hall on the way to the Med Inn and he asked if Connie has had his echo yet. I said no, that it was scheduled for tomorrow. I said, I'll be interested to see what's going on with that left ventricle. He said, "You and me both." Please pray that Connie's atrial lead to his pacemaker is secure and working efficiently and does not need to be replaced. Replacing it would require opening the chest again. Also pray that the tubes have stopped draining enough to be pulled tomorrow and we can proceed with getting home. So, the nurse seemed surprised that they were planning on pulling tubes today so I asked that they double check his drainage numbers because I don't want to withhold food for him until 2pm for them to then decide they are going to leave them in another day. The cardiologist came in and said that he was close to borderline, but she would be conservative and leave them in. They don't like for his output to be more than his weight and his weight is 12.6kg and one tube had drainage of 22, 20, 16 and other numbers greater than his weight. The last thing we want is to pull the tubes today and then have to have more tubes placed tomorrow. So, today will be a play and wait day. Status quo, if you will. If the EP people are happy, he can come off the monitors and even go off the floor and maybe even outside. Too bad I didn't bring him any winter clothes! It's freezing up here. It even got into the 30's overnight! So, we will be patient. We are also increasing his enalpril up to 2ml and keeping him on synthroid (the thyroid med) until he gets home. They want Dr. Bromberg to take him off and then check his levels. Since he's been getting it here already, checking the levels now won't exactly give us a true number. Greg stayed with ConBon last night and called early this morning to tell me that they already decided that they are pulling both remaining chest tubes today. That means that it is probable that as long as his echo and x-ray on Wednesday look good, they will send us home! Such a happy boy. His nurse wants to trade in her son and keep Connie! Connie got rid of his last IV. It was his central line in his groin and it wasn't drawing back and he doesn't need it for the morphine anymore so they removed that. He has switched to oxycodone and tylenol and ibubropfen. Seems to be working fine. 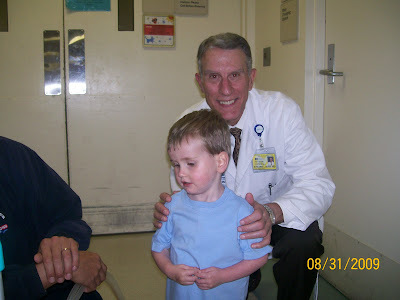 He wanted to get out of bed after dinner and walked all the way over to Pod A where he saw Dr. Bove. Then he played in the play room. After that we went back to his room to change his first "dirty" diaper since before surgery!!!! I'm sure he is quite relieved now. 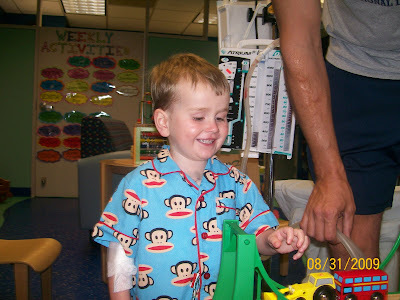 Connie walked from his room to the playroom on 5East. 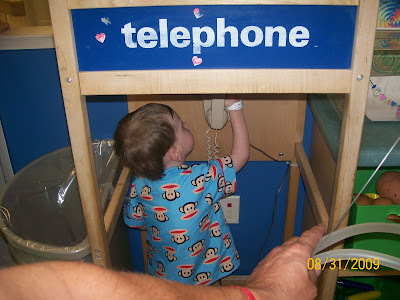 He played at the train table for quite awhile and then in the phone booth and telephone. After that, he walked a whole lap around the floor and impressed everyone during rounds. He's probably going to be sore after all that so we are going to start alternating ibuprofen and tylenol. His nurse, Carol, said he did drain quite a bit during that time out of bed. That's the goal!!! Still no word on getting off the morphine and his morning meds are almost two hours late. Gotta love nursing inservices! The Connie that we knew and love is definitely making a comeback! He woke up at 2:30 this morning (thanks to his neighbor) and was doing his tricks like fake sneezing and trying to be funny. He would poke himself in the head and then laugh. He almost got a little "wild". I asked the nurse about turning off the morphine drip (since that was the plan anyway, and since he seems more ready to get up and about, it needs to get out of his system) and she said she won't. She doesn't have orders so she won't do it. But, she will give lasix at 6am when he just had a dose at 9pm and still hasn't stopped having soaker diapers! I told her I was going to hold that 6am dose for two reasons. One is I am not getting him up at 6am to give him meds everyday once we are home. I think it is about time they get these drugs on a schedule that makes sense. The other is that less than 12 hours ago he had it and has reacted quite strongly to it if he continues to pee and pee and pee. I want to ask the NP or the docs during rounds about either decreasing the dose or going to once a day. At home, when his heart wasnt' working as well as it is now, he only took it once a day and it was a smaller dose than what he's on here. We'll figure it out, it just seems insane to me that when you get this close to home that they don't start timing things better. A nurse practitioner took out the two iv's in Connie's feet earlier this evening. One was clogged and we did both in anticipation that he might go for a walk later. Still being on a morphine drip seems to make him not such a great candidate for walking himself and he didn't exactly jump out of bed when I mentioned it so we'll try it tomorrow after the morphine is turned off. He's sleeping now and thankfully after 25 solid minutes of screaming, the six month old next to us was wheeled out in a stroller to be watched at the nurses station. Hopefully they keep her out there all night ;) I know the mom has to go pick up her other kids and arrange care for them and they live three hours away, but she said the dad was laid off so not exactly sure why he can't stay to comfort her. They are the only ones who can get her back to sleep in her crib! Connie had another whole carton of chocolate milk, a yogurt tube, a whole serving of peaches, 1/2 bag of chips and some cookie bites. We're getting healthier bit by bit. He got quite itchy and so got some more benadryl. We're hoping when that wears off he can get up and go for a stroller ride. The nurse said they want him to try to walk to the door. Not sure about that one, but I guess we'll try. He still has two IV's in his feet and one is not flushing anymore so they need to take that out first anyway. 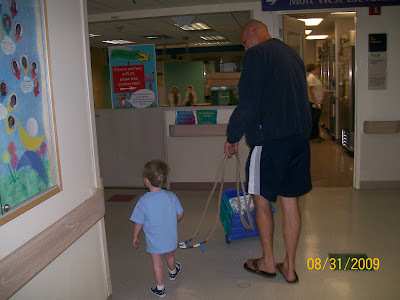 I have no idea how they expect him to walk with a line in his foot, but they've done this more than me, right? Tomorrow he'll probably switch over to oral pain meds of oxycodone and tylenol. Connie got a PRN dose of morphine and 1/2 dose of versed for the chest tube removal. He had been sleeping but woke up. He actually seemed pretty okay with it and laid nice and still. His stitches didn't close the wound all the way, but got it close. That meant they had to use a special dressing that has to stay on 24-48 hours. The plan from here is to eat, walk, lose the other two tubes, make sure pain is under control, and get all the discharge testing. The way it usually works is they pull the other tubes (whenever they stop draining, who knows when that will be) and then the next day they echo, do a chest x-ray and do a pacemaker interrogation. As long as everything looks good after that and his pain is well controlled without IV meds, he'll be discharged. He's going home on Enalapril, Lasix and the thyroid med he was taking before. He'll come off the lasix probably in a few weeks and depending on how his echo looks and how the minimal the leaking is, he may be able to just outgrow his dose of enalapril. I'm still unsure if he'll go home on amiodarone. 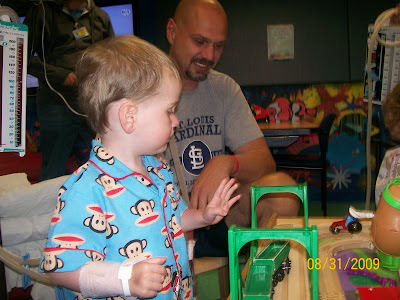 Dr. Bradley had said that he does send some kids hom on it for a few months, but they aren't giving it to him so far. The only reason for the thyroid med was because of what the amio was doing to his thyroid, so I'm not sure why he still needs that, but that's a question for closer to discharge or when we get home. 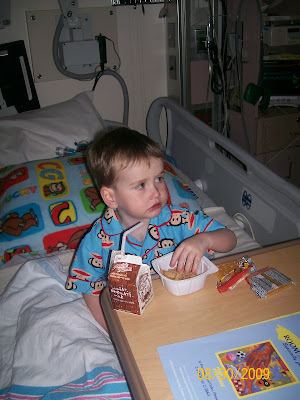 After his tube was pulled, he ate a whole bowl of cinnamon toast crunch and drank 1/2 carton of chocolate milk. The nurse couldn't believe he wasn't passed out from the sedation they gave. Every single time he wakes up he asks to eat. I think it's because he's afraid that we're going to withhold at some point since he's been NPO so often lately. Now he's snoozing and we're doing some laundry. 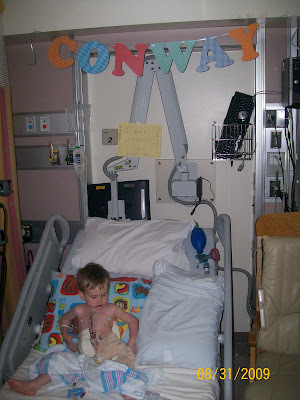 Connie's now in his new room and they are prepping to remove one chest tube. 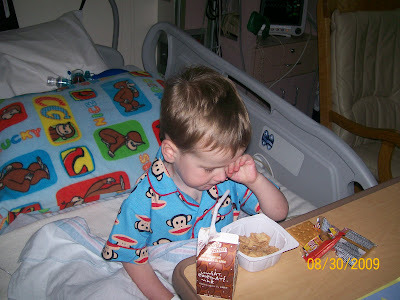 Greg was with him for the move while I grabbed a bite and when I met them in the new room, I was so disheartened to find that his new roommate is a little infant, the same infant that cried all night on Wednesday night when he was on the floor after his cath. We could hear the poor baby three doors down even with our door closed. As bummed as I am, I guess it is a small price to pay for the miraculous recovery we've had to this point. I just wish a parent would stay with the child to be able to comfort her. Check. . .Check. . .Check. . .
Everything that was planned for today is now finished other than the chest tube removal and move (planned for 11am). He's been graduated to a big boy bed out of the crib and is fighting sleep with everything in his power. He's a little mad at us b/c he keeps asking to eat and we can't let him until after his chest tube removal, but other than that he's in pretty good spirits. He required no PRN's of pain meds overnight, not even tylenol! He's getting his increased dose of benadryl now so hopefully the itching will subside. If he stays on this pace, he'll get off the morphine completely by tomorrow and then just be on tylenol. After that, the only thing keeping him here will be the drainage from the chest tubes. It could be a few days or a week, every kid is different. I told the nurses it will be so weird having to actually have instructions on how to care for his incisions at home since last time we were here, his scars were completely healed long before we saw St. Louis again. Dr. Bove came in and seemed impressed with our progress. He said he'll stop by tomorrow so we can get a pic of him and ConBon. Connie is really flying now! They just rounded and the plan is to get rid of one mediastinal chest tube, lose the arterial line, lose the foley catheter in his bladder and stop the milrinone. They are going down on the morphine to 10 and doubling his benadryl. He's now NPO until noon for his chest tube removal. He had a great night and is now going to move to the floor later today as long as he tolerates all of these changes.